Project purpose: construction of cottage eco-village with 185 households. 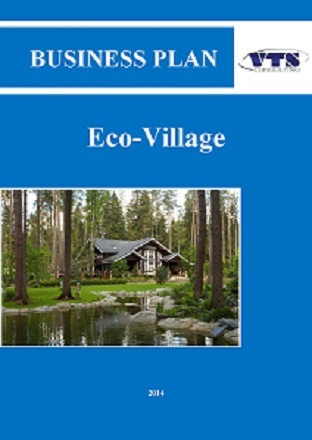 Project concept assumes the positioning in segment of business class – eco-homestead. Project competitive advantages: closeness to nature, silence, a wide range of areas of land lots and house projects, guarantees highly-qualified construction, a wide infrastructure. Project Infrastructure: complete package of systems, which provides a full housekeeping and intra-village living, – from electricity, water and gas supplies to the application of innovative and energy-saving technologies, the whole transport infrastructure, recreation areas (pond, walking areas, children's playgrounds and playground for active rest). It is planned to introduce a wide range of social infrastructure – the restaurants, beauty salon, supermarket, etc. Weighted average initial cost, RUB/sq. m.
Nizhny Novgorod region is one of the most economically developed regions of the Russian Federation. Despite the fact that the region has no significant material resources, its economy develops steadily. The region share in formation of aggregate GRP of the Russian Federation regions is *** %. In general the results of socio-economic development of the region in 2013 are positive. According to the estimation, regional economic growth was *** % (while the forecast was *** %), unlike in Russia as a whole, where in 2013 the slowdown of economic growth was observed: according to the preliminary estimate, the Index of Physical Volume (IPV) of GDP amounted *** % after *** % in 2012. The tendency of advance of regional economic growth in comparison with Russian average level has been observed for last four year (since 2010). First quality projects of cottage villages in region have appeared quite recently – in 2005. Before this the cottage segment has been represented by «spontaneous» villages with minimal infrastructure and inhomogeneous buildings, cottage groups and separate cottages near the rest homes, in villages and hamlets. In 2007 suburban real estate market has intensified. About *** developers, including Moscow and foreign companies, have entered the market. In 2008 the amount of constructed suburban cottage villages has exceeded ***, moreover few projects were in development. The territories near *** began to be used actively in *** and *** directions. Despite the crisis in 2008 with all characteristic consequences during the following years, there was observed the rapid growth of the market in direction of development of new lands – at this moment in the suburban real estate primary market of Nizhny Novgorod region *** cottage villages in various stages of development are represented; the total amount of households is ***. The amount of cottage villages which offer for sale the «bare» land (land lots without a contract) and lots with house (contract for the construction and ready-made housing) are distributed almost equally, a larger part of offer are focused in *** (south directions) – more than 3/4 of villages amount and 4/5 of household amount. Besides, the share of leaders – *** directions – is only 2/3 of the total market. It is reasonable to forecast the growth of interest to left bank and its development rates not earlier than 2014 – after commissioning of the new bridge over the ***. the cost of land – *** RUB/acre. Diagram 2. Structure of Shipped Products by Kind of Activity «Shipped Production» for January-March 2013.